You create a website. You start “blogging.” You share your posts with friends and family on Facebook. You sign up for Twitter (or sign back in after giving up on it months prior). You start sharing your posts there. You find others to follow. You comment on their posts. The comment on your posts. You start seeing your web traffic increase. It’s a tough question, that’s for sure. You’ve never created a “product” and the only frame of reference you have for what you could create is what others have done. You don’t want to copy anyone. So how do you come up with that first product? There is no silver bullet and if you follow me anywhere – Twitter, Facebook, SnapChat, Periscope – you’ll hear me say that a lot. 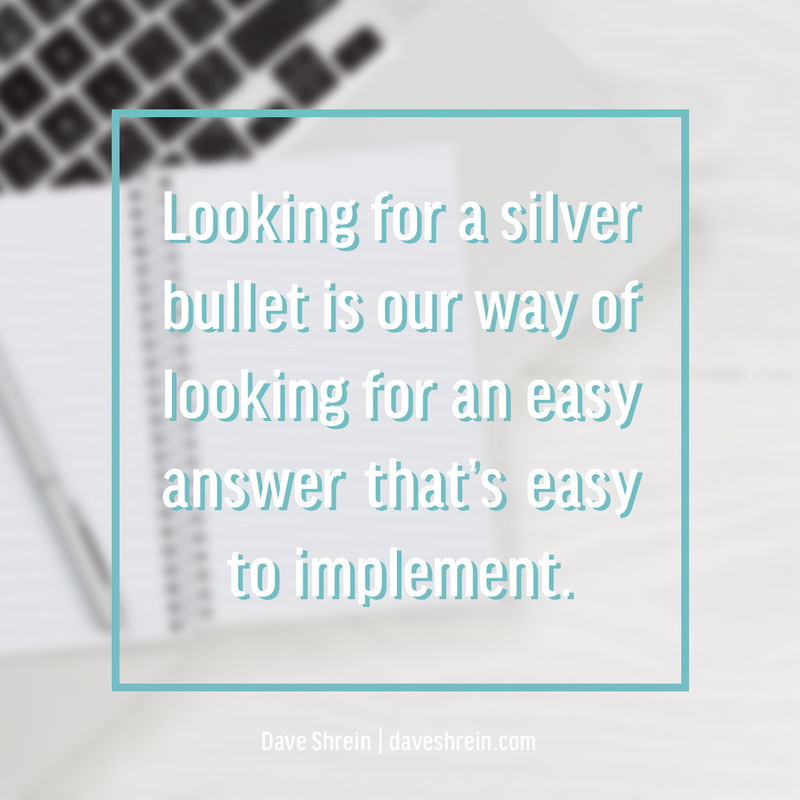 Looking for a silver bullet is our way of looking for an easy answer that’s easy to implement. Easy doesn’t exist. What you need is a clear direction. Having a clear direction will allow you to move forward with purpose, regardless of what your product is. For starters, you need to discover what it is you make look easy. Send an email to 10 people who know you incredibly well. These are not casual acquaintances or people who really only know one side of you. These are people who have been with you over the long haul and have celebrated your wins and mourned your loses. Send them an email asking them to share with you what it is you make look easy that the rest of the world considers hard. From there, I have a series of questions that may help you identify a good direction. The answers, paired with what you make look easy, will begin to help you feel confident about taking steps forward in one direction, increasing clarity along the way. What are the most frequently asked questions you receive from the people who are being impacted by your platform? What are they asking you to help them with? What is one topic that you know a lot about and, without notes, you could talk about for 30 minutes, not skipping a beat or being hard pressed to answer questions that come your way? When are you at your best? Are you at your best through written communication? Do you do better with video based communication or illustrated communication? If you’re going to create a digital product you’ll want to make sure that you don’t go down the path of delivering via a medium that isn’t a win for you. Do you have any unfinished products related to your why that may not be your ideal first product, but could be finished fairly quickly giving you a complete learning experience? Finishing a product will give birth to new ideas? What service do you do for others that you enjoy and how could you create that into a product? What are you good at and do not enjoy? Cross off the list anything that you do not enjoy doing – no matter how good you are or how much money you could make. You may come back to it later, but it will steal your joy now and slow down your momentum. These are not the end all, be all questions to lead you to your first product. They are meant to get your mental juices flowing and hopefully birth some larger ideas that can transform into a clear direction. When I was fired from my job in July of 2014 I almost immediately decided to launch an online marketing business and shortly thereafter, my first product. My life had been changed by the opportunities that had come through Twitter and after missing out on years of building a network because I didn’t understand Twitter, I decided to make my first product a course on Twitter to turn Twitter into a productive networking tool for everyone who had given up on it (notice I said, everyone – who the heck was my target? I’ve learned so much since then). When you have never done something before there is opportunity to waste time. Going in alone will ensure that you do not produce your best version of the product and it will be an unnecessarily long process. I learned this the hard way. I began creating the Your Guide to Twitter course in August and launched it unfinished in November. I did not complete the final module until December. I had hopes and dreams of making $5000-6000 on the product and after the first year of sales (FIRST YEAR) I had brought in approximately $500. The end product was good and I am very proud of it. It is an amazing value and reports of how it has helped others have been encouraging even two years later. Despite the struggles, I would not have traded the experience for anything – though I would have brought someone else in to partner with because I know now that would have produced a better product and a better launched.. Choosing Twitter as the basis for my product was a natural fit for me because it was something I knew well and enjoyed using. It was easy to teach because the network is incredibly concrete and the one piece that’s hard to understand, relationship building, is something I am good at. It was a good fit. When launching an online product there is a lot you have to learn which you did not account for. Trying to create the product and learn all the “other stuff” you never considered needing to know slows down progress as well. Going back, it would have been wiser to create the product and either hire someone to put the technical pieces together or wait until the product was finished and only then focused attention and energy on the technical pieces – as opposed to doing it all at the same time. As you walk through building out your first product, whatever it is, you will naturally have high expectations for the ROI. Like me, you will have dreams of the freedom that comes with a product that scales. Before you begin you will have extreme clarity on how much money you’ll make (which you can’t control) and very little clarity on how that product needs to look and how to market it once complete (both of which you can control). The most important thing to remember is that your first product is not your last. It is more important for you to launch your first product than it is for you to perfect it. Everything contained in this post will make much more sense after you’ve produced and marketed that first product because you’ll have hinds sight – which is always 20/20. If you are stuck and even after reading this article you do not have any more clarity on what you need to do next, send me a Tweet. My passion is coming along side entrepreneurs and helping them get unstuck from all the silly things that prevent them from launching their platform online. 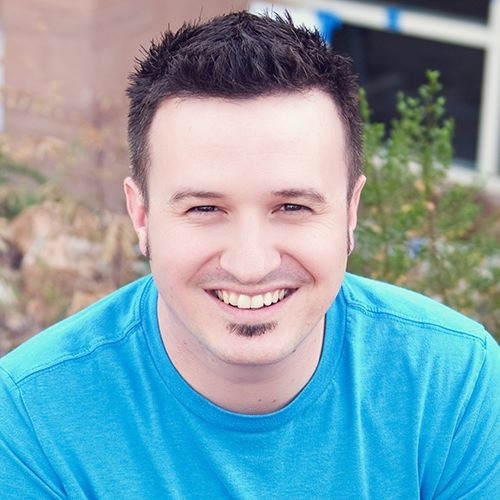 If it relates to web, email, social and the strategy and tools to maximize each of them, I’m a guy who will do whatever I can to help you get unstuck. Bottom line, take action now and don’t wait for perfection. Action is more important than perfection because without action you have zero chance at perfection… or even 80% of perfection.